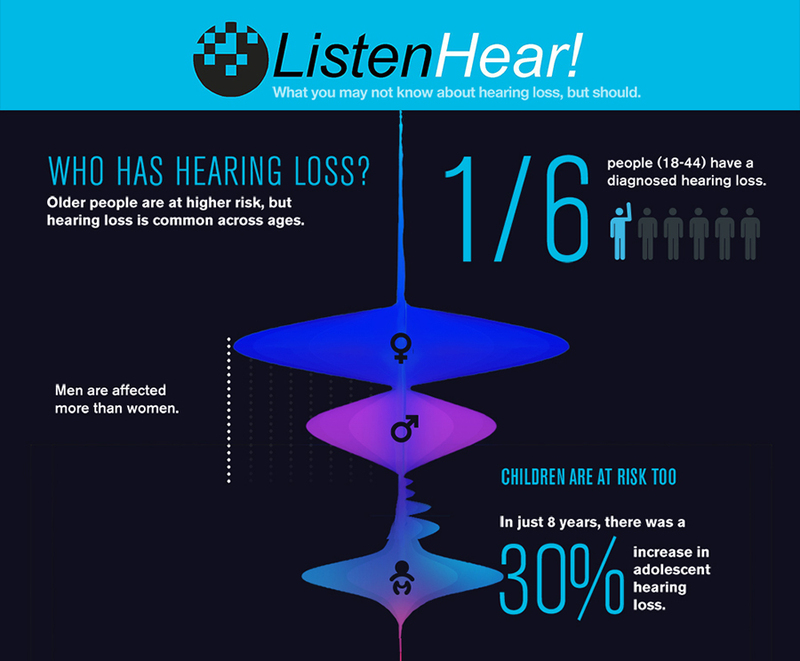 An estimated 48 million people in the United States have hearing loss,i yet only 20 percent of people who could benefit from a hearing aid wear one.ii Cost is a major barrier as the average price of a hearing aid is $1,500 per ear, and can run as high as $3,000-$5,000 each.iii With the introduction of HearTEK™ Leasing from EPIC Hearing Healthcare (EPIC), individuals with hearing loss now have access to the latest name brand hearing aid technology without the barrier of huge upfront costs and with the peace of mind that they will not be locked into out-of-date technology. Here’s how it works: Almost everyone qualifies during the application process and there are no application fees or required security deposit. With a licensed hearing aid professional, patients will select a hearing aid best suited for their needs and have access to all levels of technology at four monthly payment levels – $49.99 (basic), $79.99 (standard), $99.99 (advanced) and $149.99 (premium).iv By spreading hearing aid payments across a lease term up to 30 months, patients can finance a hearing aid up to $5,000. 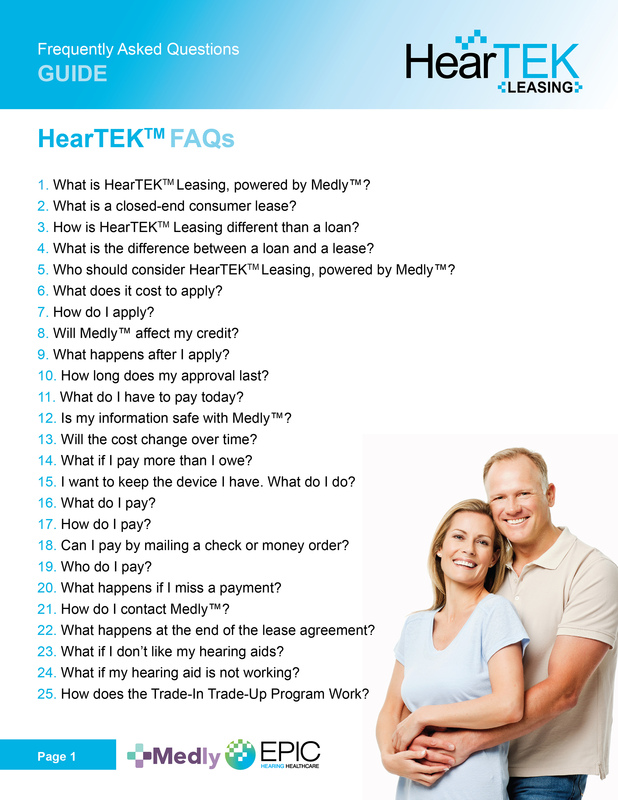 HearTEK Leasing participants have the option at 18 months to trade in their hearing aid and upgrade to a new model. They can either select a model in their current pricing tier and restart a lease at the same monthly payment, or can upgrade to a higher pricing tier. If participants are not interested in upgrading, they can continue with their lease unchanged. 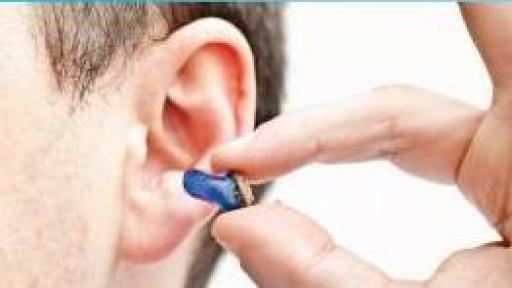 Participants can also buy out the lease at any time to purchase their hearing aid without penalty. 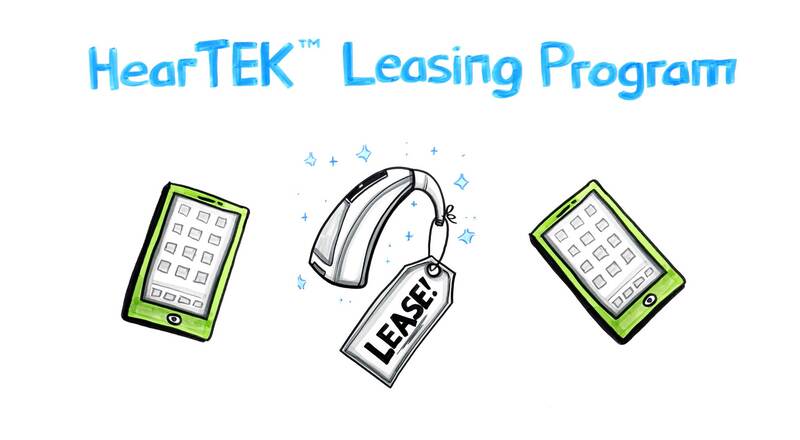 EPIC has partnered with Medly™, a Bristlecone Holdings company, to create this first-of-its-kind “trade-in, trade-up” leasing program designed specifically for the hearing aid customer. Every lease also includes an extended product warranty, the only patient financing solution to do so. 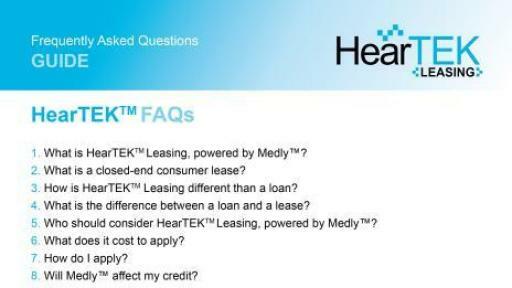 For more information, call (844) 586-9403 or visit www.HearTEKLeasing.com. 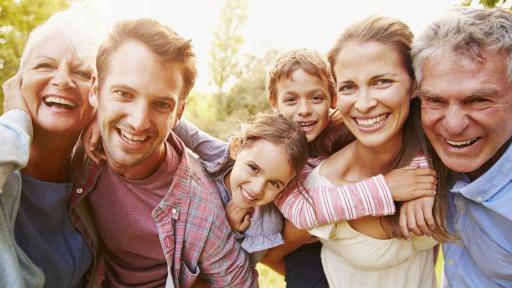 Founded in 1997, EPIC Hearing Healthcare (EPIC) is the first in the country to provide access to hearing care as an ancillary or specialty benefit. 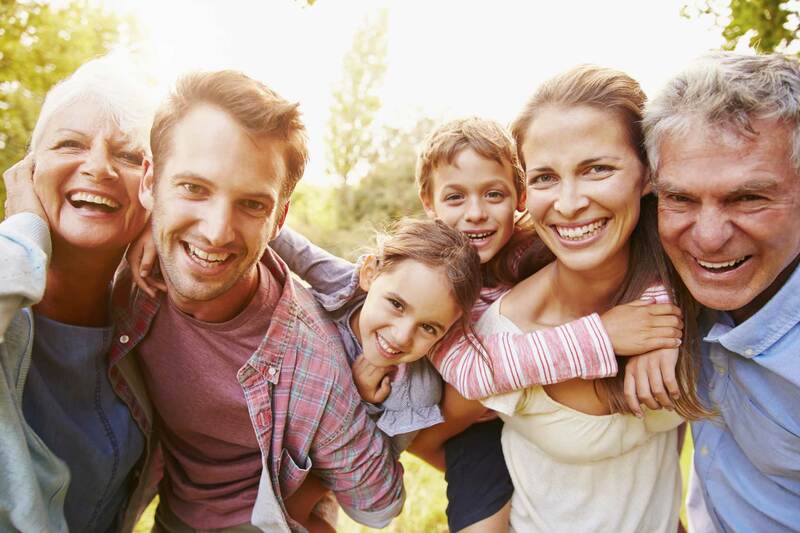 With its extensive network of audiologists and hearing healthcare physicians, and distribution relationships with major hearing aid technology manufacturers, EPIC is now the national leader in hearing healthcare, and the only organization to offer hearing coverage as a fully insured benefit plan. 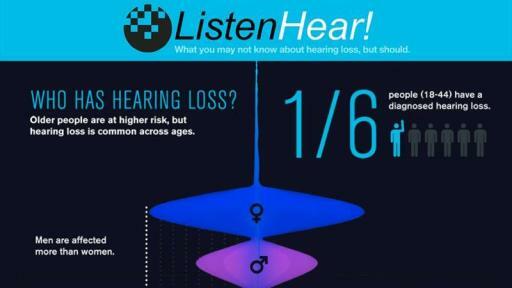 More information is available at EPICHearing.com. iv Pricing does not include accessories. For qualifying applicants only. Not all applicants are approved.